Like rushing down the aisle without the wedding bands. 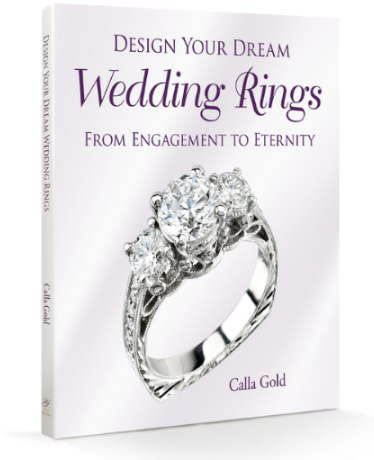 I got a call recently from Hal & Rick about their need for wedding bands. Between upgrading their new home to be handicapped friendly and finalizing the adoption of their child they hadn’t had time to get married. Their first thought was just to get two plain platinum wedding bands that matched and be done with it. 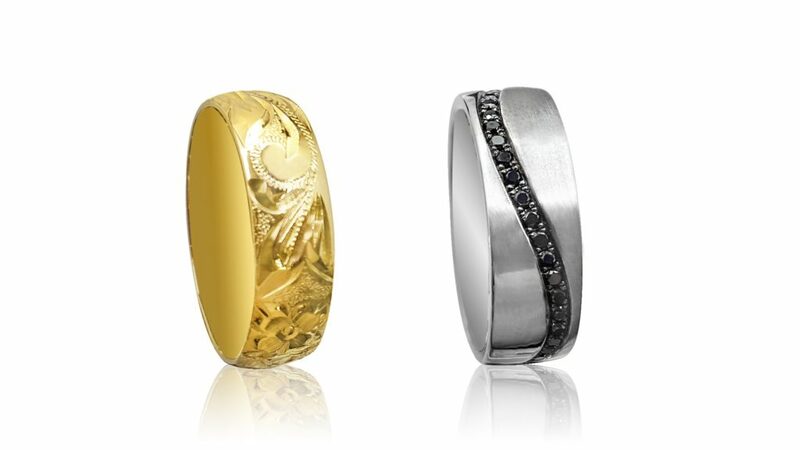 In celebrating my LGBT client’s commitments, I have opinions about their wedding jewelry. Don’t be ordinary I say. 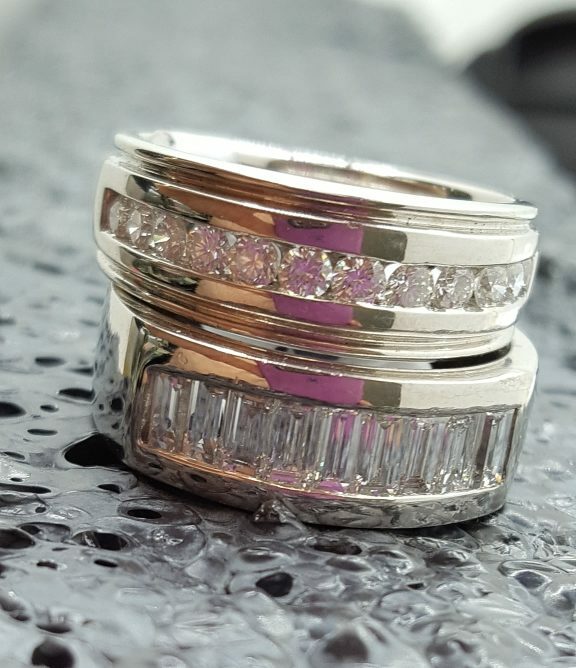 A Recent Pair of Men’s Wedding Bands. These Two Men Wanted Serious, but Classy Bling. We all got quiet for a minute and then all smiley, because it is great that my gay friends can marry legally. I won’t judge how someone loves and who they choose to love. I’m about celebrating that two people have found each other and want to make a life together. But I digress. 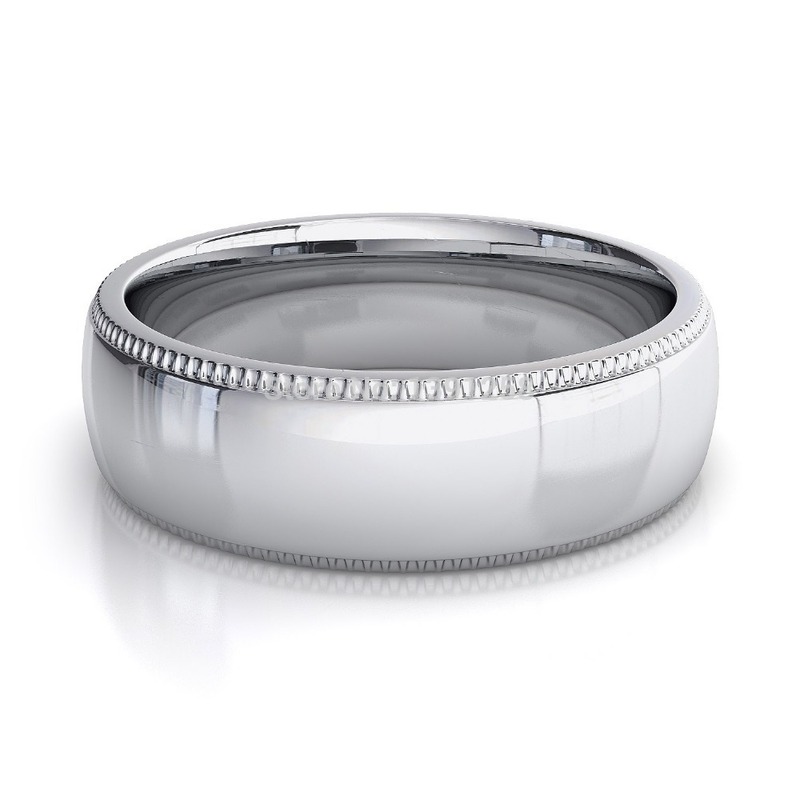 For your greatest happiness in your rings, trying on different metals, widths and designs will help you find that “you” ring, that makes you look good while rocking your married happily status. 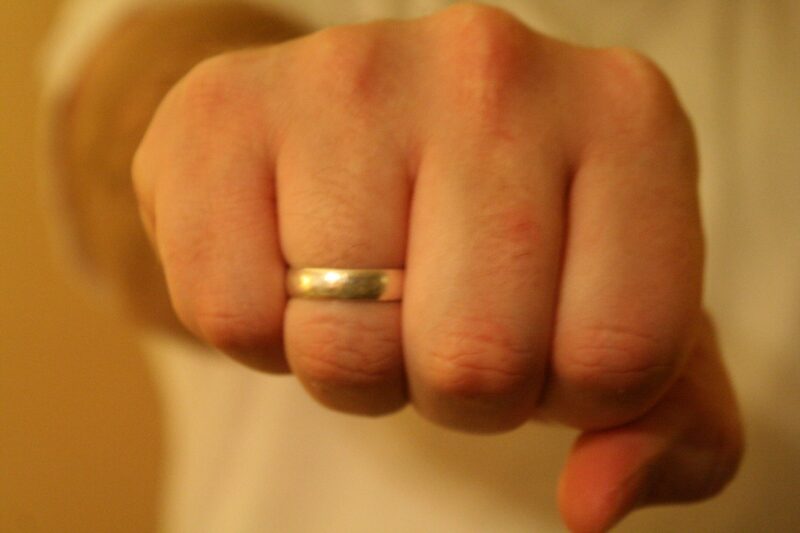 In trying out rings, we found that Hal looked good in an 8mm width because he has large hands. Rick, with his long piano player hands, looked better in a 6mm width. Hal it turned out looked great in platinum, but not great in yellow gold. Or rose gold for that matter. Rick looked more tan when wearing the yellow gold. Once they’d figured out their best metal color look the excitement amped up. Don’t We Need to Match? Rose Gold was Flirted with Until Hal and Rick Saw That it Wasn’t Their Color. 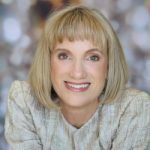 Matching isn’t how we say “I love you.” Because you’re each different you each may need different styles with a single cohesive element to join them together. 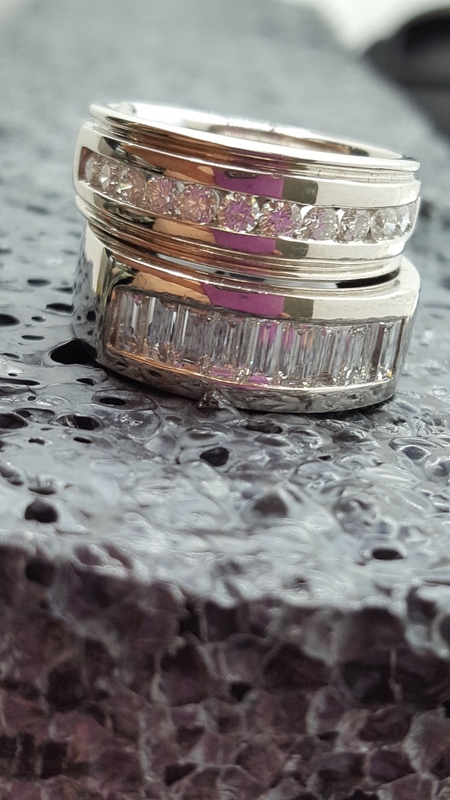 I pointed out that each of them should be really comfortable in their rings and love the way they looked in design and style on their hands. Hal ended up wanting diamonds on his, black diamonds, because he’s a rebel. We laughed, but seriously he rocked the black diamonds. Rick liked a distinctive design and really liked my hand engraving. He’s in the men’s garden club, has a gorgeous garden, and he and Hal had met through the gardening club. The floral theme seemed to be perfect for his ring’s engraving. Rick said, “I know it looks gay, but I’m gay!” I love him! Hal felt since he was going with a different width, a different metal, and diamonds, that he wanted an element to go with Rick’s band. Since Rick was going with a curvy engraving design, they decided on a curved pattern with the black diamonds that Hal wanted. That would be their unifying element. Rick and Hal’s Chosen Rings. Each One Just Right for Them. The two rings were made and they gave their vows over them. Hal and Rick were really happy they hadn’t gone for the, “check an item off the list,” method of wedding ring selection. Each of you is unique and so should your rings be. NPR Quotes Calla Gold on Titanium Ring Removal! Great, these are looking so good and design is looking so charming. I like how you chronicled the story of creating the perfect bands with pictures. It helped illuminate not only the spirit of this couple, but also their unique individuality. This was a touching story from start to finish, and an admirably progressive one. Thank you for the sharing it Calla. These are wonderful! What fabulous symbols of their commitment to each other! Congratulations! What a beautiful story, Calla! 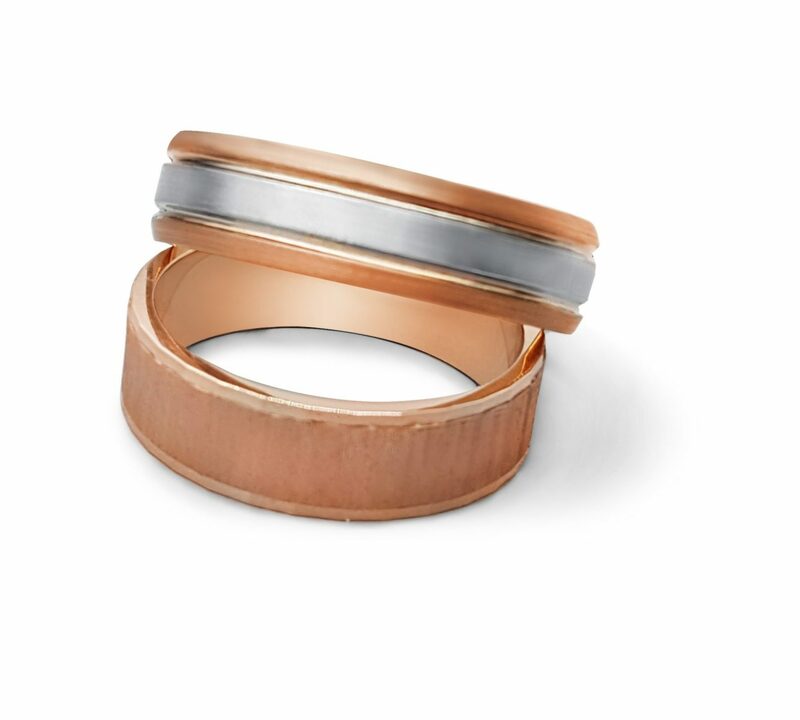 This is so great that you are writing about these two lovely men’s wedding bands. I didn’t know if there were any rules of thumb for gay wedding rings. I love that you were able to find rings that fit their unique personalities so well.